Buddha Purnima celebrates the birth of the great Lord Buddha, the founder of Buddhism. As you know, we have a habit of celebrating the birthday of our fellow humans in as grand a manner as possible. The birthday of Lord Buddha gave us one more chance to urge you to join into our jubilations and do you not think this pretty little crossword quiz on Buddha Purnima will be a perfect way to have some fun together? Try it out and enjoy yourself. If you enjoy solving this Buddha Purnima Crossword Puzzle, click here for sure to share it with your friends and dear ones. Wish you a happy Buddha Purnima! 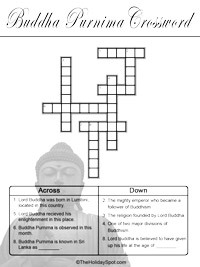 Entertain yourself on Buddha Purnima and also know a little about the auspicious occassion with a nice, thematic crossword puzzle. All you need to solve the puzzle is a printout of the crossword template (issue one from below using the printing instructions), solve the verbal clues supplied and infer the words that are likely to go into the corresponding boxes of the puzzle. Click on the "Print" button provided in the new window or go to the top of the menu bar of the window and click File>Print to take out a print. To get an idea of how your printout will look like, click on File>Print Preview before you actually take out a print. Grab your crossword printout and crack the clues to fill in the boxes. Crack the word riddles, solve the puzzle! 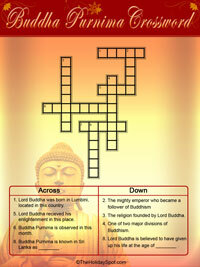 Enjoy this nice Buddha Purnima Crossword Puzzle.